Image: Typical Hasegawa instructions are easy enough to follow. These include insets from what appears to be the "series bible". The YF-21 Advanced Variable Fighter (AVF) Prototype was designed and built in 2039 by General Galaxy as their entry for the Project Super Nova design contest sponsored by the UN Spacy to develop the replacment for the aging VF-11 Thunderbolt. The YF-21 was one of two designs selected for the final competition at the New Edwards Flight Center on planet Eden; the other design being the YF-19 AVF designed by Yang Neumann of Shinsei Industries. Unlike the more traditionally designed YF-19, the YF-21 was a showcase of leading-edge combat technology. Many of fighter's systems were advanced prototypes, based on captured Zentraedi and cutting-edge human systems. The most advanced of these were the Brainwave Control System (BCS) and Brain Direct Imaging (BDI) system. These enabled the pilot to control all functions of the aircraft literally with his thoughts. Two prototypes of the YF-21 were constructed, with the first one having a conventional flight control system and the second one equipped with the BCS and BDI systems. Though the second prototype YF-21 was lost in the "Sharon Apple" incident and theYF-19 was declared the winner of Project Super Nova, the manufacturer was not discouraged. Two years later General Galaxy released the VF-22 Sturmvogel II, an advanced combat aircraft based on the YF-21 prototype. Although the VF-22 did not include the controversial BDI and BCS control systems of the second YF-21 prototype, it proved to be an extremely able aircraft and was purchased by the UN Spacy on a limited basis as a special forces fighter. Ever since Rob sent me the Macross Plus OVA years ago, I've wanted models of the two competing fighters. 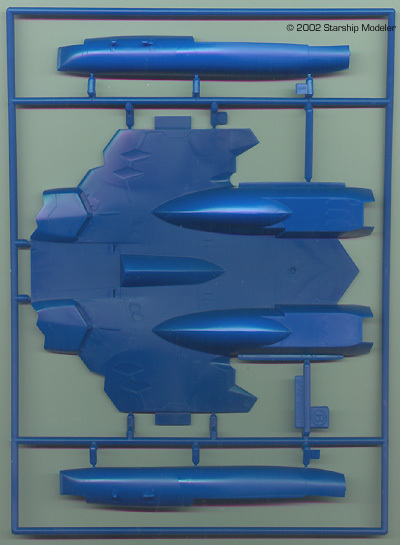 All that was available prior to Hasegawa's interest in the series were hideously expensive resin kits from Japan, or various toys/action figures. You can imagine my joy when 2002 rolled around and Hasegawa released both the YF-19 and the subject of this review, the YF-21. 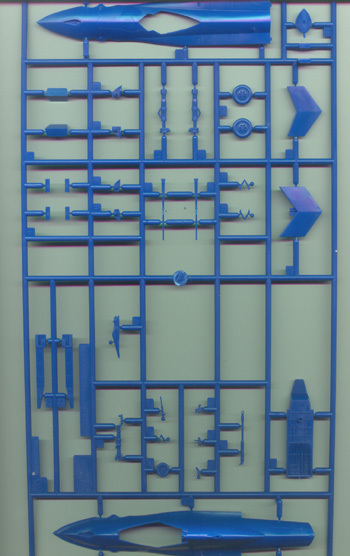 Inside the box (the art on which would have been enough to trigger the buying impulse in me) are five sprue trees of blue plastic parts, one clear sprue, decals and instructions. The plastic parts are state of the art in every fashion: crisply molded, sharply detailed, and almost completely defect-free (I do see a few miniscule mold seams). Attachment points are quite petite, which should make freeing even the smallest parts trouble-free. You get a pilot to fill up the reasonably-detailed cockpit, nicely done landing gear and gear wells (though the insides of the doors could stand some detailing, I think), sharp detail inside the afterburners and finely engraved panels all around. The clear parts are thin and distortion free; bagging them separately keeps them from being scratched before they're used. 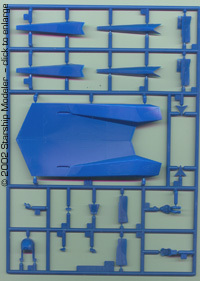 Decals are provided for what appears to be at least two schemes, although only one is shown on the paint guide. 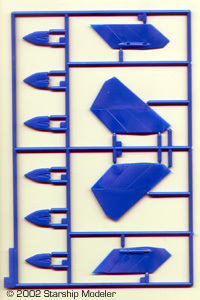 The bulk of the markings are for Bowman's second prototype, the one lost when he destroyed the X-20 Ghost prototype. Interestingly, you have the option of UN Spacy arrowhead roundrels with and without "New Edwards Test Center" inscription around the rim. The extra decals are grey, and include a full set of numbers .... for additional prototypes (I only know of one other). 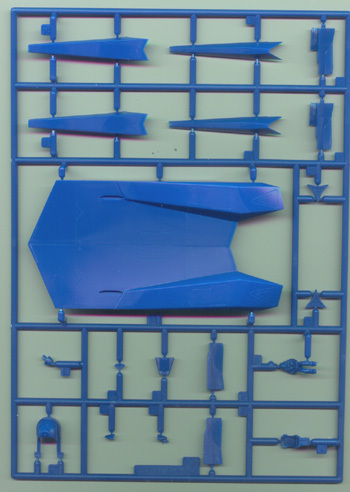 Anyway, the decals appear identical to other current Hasegawa releases -- thin, perfectly registered and (presumably) opaque enough not to show color separation through. 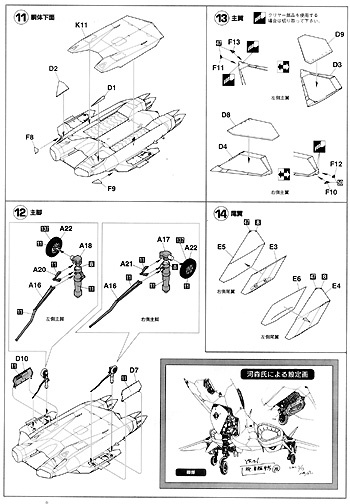 The instructions provide a guide through a series of assembly steps, each depicted in an exploded diagram line drawing. Color callouts are provided throughout, and are keyed to a color list in the front of the booklet. 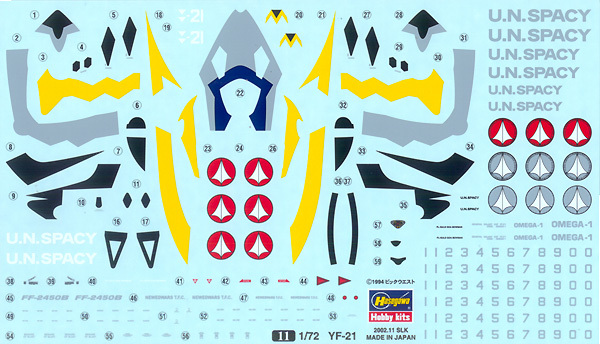 A comprehensive decal placement guide shows where the myriad stencils go - again, just for the one variant as far as I can tell. Is it accurate? Sure looks it to me. That's based solely on my recollection of Macross Plus - I don't have any detailed references with which to check. I can't think of anything not to like about this kit, and I'm eager to get started on it. You get a nice pile of plastic and decals for the price, it's a subject I want to build ..... what more's needed? The kit appears to be of the "shake the box and out pops a model" variety --- meaning it should enable even folks with my fumble fingers to produce a good looking model with something less than monumental effort. See a full build review of this kit here. 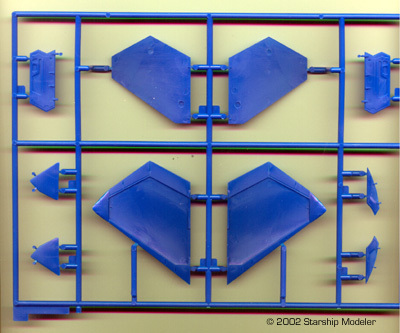 This page copyright © 2002 Starship Modeler. Posted 24 March 2002; Last updated on 25 September 2002.